Emory Healthcare employees demonstrated their generous spirit of giving and supporting those in need by contributing nearly $17,000 in monetary donations and toiletry items to Mercy Care Atlanta. These items will be bundled into toiletry kits and distributed by Mercy Care throughout the year to homeless shelters and outreach initiatives in the Atlanta community. This longstanding tradition started at Emory Saint Joseph's Hospital in 1985, when employees began collecting toiletry items in observance of Mercy Day, as a way of extending the Mercy mission of the hospital by serving the poor and vulnerable at Mercy Care Atlanta. Mercy Day is held annually in recognition of Catherine McAuley, the founder of the Sisters of Mercy. Saint Joseph's Hospital was in turn founded in 1880 by four Sisters of Mercy who traveled from Savannah, Ga. to Atlanta to establish the city's first hospital. In 2014, employees throughout Emory Healthcare joined Emory Saint Joseph's campaign to collect thousands of toiletry items which include shampoo, conditioner, soap, lotion, socks and other basic hygiene necessities. 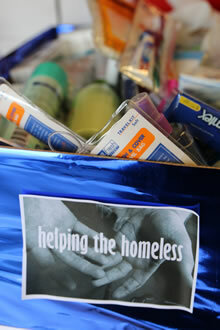 This year, Emory Saint Joseph's raised $10,225 in toiletry items and monetary donations, which equaled 3,408 kits, while Emory Healthcare employees systemwide donated an additional $6,711, equaling 2,237 kits.